Data are often collected within administrative boundaries, as if those boundaries contain all the necessary knowledge. But boundaries can be porous – with people and resources crossing through. Women escaping domestic violence are on the move – crossing administrative boundaries if they need to: either for safety, or support, or to find services. However, if those services – and the authorities which plan and commission those services – only look within their administrative boundaries, they will not be able to see or understand what is going on. They won’t have the data they need to provide good evidence for their decisions. 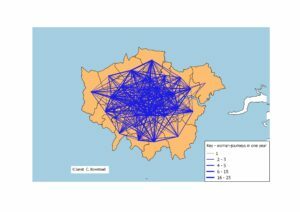 For example, if London services – whether at the Borough-level, or across the city – only collect London data, they will only get part of the picture. They will see London women accessing London services; and they will see women from outside London coming to London domestic violence services. But they are missing a key part of the picture. 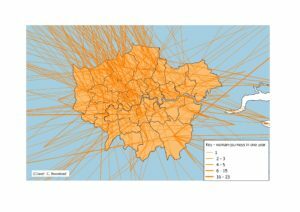 Many London women escape domestic violence by leaving London. They may go elsewhere in South East England; or may go much further. In fact, for the period of time when there were country-wide data from the Supporting People Programme, every year more London women left to elsewhere in the country, than women came to London to access services. 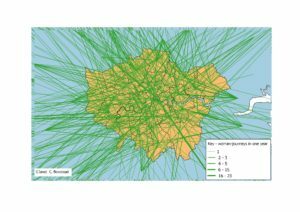 If authorities, service providers and commissioners only look at London data they only get a partial picture of London women and domestic violence services (http://www.domesticabusemigration.co.uk/). They do not see all the London women who go to services elsewhere – that there are more women leaving London than coming to London. That for domestic violence services London actually needs and uses the rest of the country more than it serves it.